One of the most interesting episodes to air on "ANGEL" during its Season Five turned out to be the eighth episode called (5.08) "Destiny". Written سے طرف کی David Fury and Steven S. DeKnight, the episode is considered one of the best in the series. It also marked a relief for many viewers who had become weary of Spike in corporeal form. While reading an old review سے طرف کی someone named Tchaikovsky about the Season Five ”ANGEL” episode, (5.08) “Destiny”, I noticed that the reviewer discussed a lot about Angel and Spike’s relationship as ”brothers”, whether they were in their souled یا unsouled states. When I first viewed that particular season, I noticed one particular thing about it. There seemed to be a great deal of focus upon brotherhood. a poll گیا دیا کر شامل: Angel which guy has the best taste in fashion? In Cavalry, after knocking out Cordy, Angelus heads upstairs. Who is the first person he comes across? 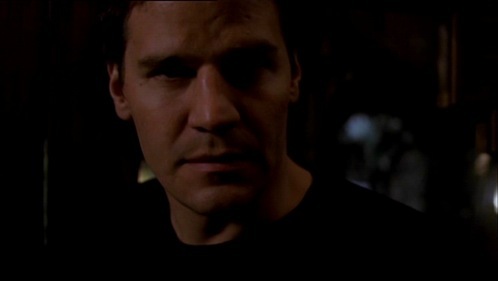 ANGEL EPISODE "DISHARMONY" WHAT DID آپ THINK?